Earlier in the day, the Guild, which has around 1,100 pilots as its members, decided to stop flying from April 15 in protest against non-payment of salaries since March. The pilots, along with engineers and senior management, have not received salaries since January. 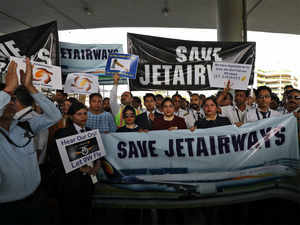 MUMBAI: Jet Airways pilots body, the National Aviator's Guild (NAG), Sunday deferred its "no flying" call to a later date, particularly when the management is scheduled to meet the lenders on Monday. "It is come to our notice that there is a critical meeting planned tomorrow (Monday) morning with the airline management and SBI." "In light of the meeting, the members have requested, through their team leaders, that the call of 'No Pay No Work' be deferred to give the airline a chance of survival. Accordingly, as requested, the Committee would like to inform all that the decision stands deferred for the time being," the Guild committee said in a late evening communication to its members. All pilots are still requested, however, to be present at Siroya Centre at 0930 hours on April 15 in their uniforms, it said. Siroya Centre is Jet Airways headquarters in Andheri suburb in Mumbai. According to NAG, it has also called upon other departments to join the gathering at the headquarters as a show of unity. An Open House will be called shortly as per the availability of the venue and the committee members, the communication added. The pilots, along with engineers and senior management, have not received salaries since January. The debt-ridden carrier has also not paid the March salary to employees of other categories as well. "As on today, we have not been paid for nearly three-and-a-half months and we do not know when we will be paid. So we have decided to go ahead with our call of no-flying from April 15. All 1,100 pilots of NAG will stop flying from 10 am Monday," a Guild source said earlier in the day. The NAG, which claims representation of around 1,100 pilots of the total 1,600 with the full service carrier, had in late March called for no flying from April 1 over non-payment of salaries. However, on March 31, it deferred the agitation to April 15, saying it wanted to give more time to the new management. Jet Airways is at present under the management control of SBI-led consortium of lenders after the approval of a debt-rejig plan last month, which also led its founder chairman Naresh Goyal to quit.